My parents read lots of books to my brother and me when we were little. I had many ‘favourites’ but my brother particularly liked one book, The Giant Jam Sandwich, above all others and I can still remember hearing it countless times. It’s a classic that I think no bookshelf should be without but I’ve found another exciting story about cake that will sit nicely alongside it. 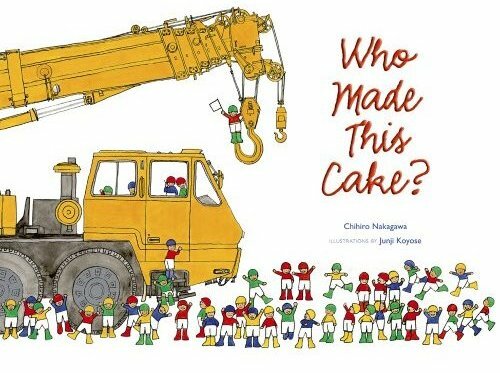 For little boys (and girls) who are fans of diggers, cranes and earthmovers and who also like cake – a combination of interests that applies to many – the story of Who Made This Cake? by Chihiro Nakagawa is guaranteed to please. In an industrialised Lilliputian world, little people use big machines to make a giant birthday cake. Hundreds of workers wearing hard hats, waving safety flags and poring over plans turn baking into a construction zone. There is very little text but not much is needed because the utterly charming illustrations tell the story and it’s the kind of book that children want to ‘read’ themselves. Every page is busy, busy, busy with dump trucks carting loads of flour, cranes lowering eggs into the bowl and diggers carving into butter. My favourite page shows the workers on their break while the cake is cooking, overseen by a little guy in a cherry-picker. Children from age two upwards will enjoy this story. 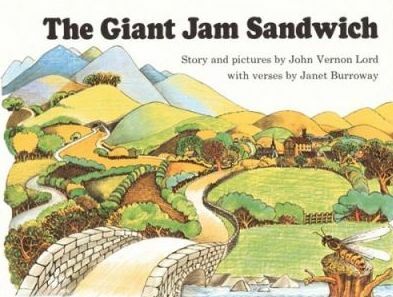 For those not familiar with The Giant Jam Sandwich by John Vernon Lord and Janet Burroway, it’s the story (in rhyme) of a village in crisis after being invaded by wasps. The villagers decide to capture the wasps in a giant jam sandwich and set about baking a huge loaf spread with truckloads of butter and jam. Similar to Who Made This Cake?, the appeal for children is in the crazy scale of ordinary things – beautifully detailed illustrations show the villagers spreading butter and jam with shovels (all the while swatting wasps) and helicopters positioning slices of bread. 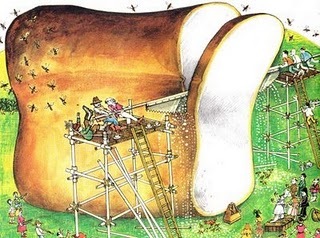 The Giant Jam Sandwich is suitable for children aged four and up. Who Made This Cake? is available from Fishpond for $21.95. The Giant Jam Sandwich is also available from Fishpond for $14.95.